You can help preserve Heritage Breeds by purchasing their meat or eggs or by raising them yourself. The need for livestock conservation is urgent. Many of our heritage breeds are threatened because agriculture has changed. There are fewer small farms and modern food production now favors the use of a few highly specialized breeds selected for maximum output in controlled environments. Many traditional livestock breeds have lost popularity and are threatened with extinction. They are an essential part of our American agricultural inheritance and an important resource for our future. Keeping these breeds alive protects genetic bio-diversity in livestock and poultry species. The loss of these breeds would impoverish agriculture and diminish the human spirit. For the sake of future generations we must work together to safeguard these treasures of the past. 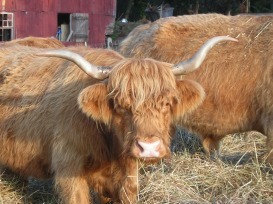 The Highland is the oldest registered breed of cattle, with the first herd book being established in 1884. Highland beef is meat that is lean, well marbled and flavorful, with little outside waste fat (the Highland is insulated by long hair rather than a thick layer of fat). For over 20 years, the Highland and Highland crosses have graded in the top of their respective classes at the prestigious National Western Stock Show in Denver, Colorado. Our Pastured, Better than Organic Beef is available in our 25 lb variety pack, by the Quarter or Half. And we almost always have 1 lb packages of Ground Beef, Stew Meat or Kabob Cubes at the farm. See our Ordering Instruction page for more details. Delaware, New Hampshire Reds, Rhode Island Red, Speckled Sussex, Marans & Wellsummer chickens- Some of the finest and rarest brown egg laying, dual purpose chicken breeds are laying their eggs here, at Sycamore Spring Farm. 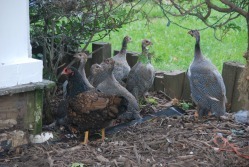 Our poultry free range from morning til dark and they are locked up at night for protection from predators. 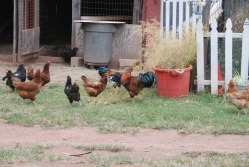 Contrary to some beliefs the free range chicken's favorite place to be is NOT out in the "pasture". They like to comb the edge of the woodlands where they can be in their natural habitat. Scratching through the rich forest floor humus, decaying leaves and pine needles looking for the grubs, beetles and other insects that are the REAL natural protein source for these birds. Sorry, but due to State Health Regulations...we DO NOT sell any live poultry or eggs for hatching..
Narragansett Turkeys have traditionally been known for their calm disposition, good maternal abilities, early maturation, egg production, and excellent meat quality. This historic variety is unique to North America. They are part of our traditional American culinary history and the same turkey that our forefathers knew and cherished. Their superior taste is a result of being raised as nature intended with plenty of open space in a healthy and caring environment and fed only a natural diet Their unlimited opportunity for exercise in the fresh air and sunshine produces a lean and tasty turkey. You won't find any antibiotics, animal by-products, preservatives or hormones in any of our farm animals. Simply put, your Heritage Turkey should be the most flavorful, tender, juicy and HEALTHY turkey you will ever taste! Reserve Your Turkey Early-Deposits due by September 1st to guarantee YOUR Holiday bird for Thanksgiving or Christmas! Dark Cornish Chicken- Cornish are broader breasted and shorter legged than the traditional barnyard fowl. The meat is slightly darker on the Cornish but the skin lighter - its taste is exceptional. Developed as the ultimate meat bird, the Cornish has contributed its genes to build the vast broiler industry of the world. Originally named the "Indian Game," the Cornish is an English breed that came to this country in the 19th century. The true original Cornish are movers and need space to exercise and develop their muscles. This variety is very rare at this level of purity. We are very fortunate to have a number of these beautiful birds as breeding stock. As the name suggests these geese originate from the area around Toulouse in southwest France. It is a grand bird, with a weight of up to 28lbs The original grey colored breed is a very old one and the name has been recorded back as far as 1555. The breed was first brought to the United Kingdom in 1840. People have long selected the French Toulouse as a utility bird found on small farms and homesteads. These general purpose farm birds are also known for their delicacy-"fois gras". The breed is endangered. Eggs are very seasonal! Orders for Christmas Goose need to have deposits paid by September 1st. The Muscovy Duck has been domesticated for centuries, and is commercially known as the Barbary duck. This breed is popular because it has delicious tasting meat and is less noisy than other domestic breeds. The meat is lean, unlike the fatty meat of Mallard derivative ducks, the leanness and tenderness being often compared to that of veal. Muscovy's are also the ideal farm duck...they forage the fields, do not pollute the farm pond and are capable of putting up a good defense against predators because of their courage, ability to fly, strength and claws. Fresh or Frozen duckling is available November through January each year. This breeds standing has moved from "Critical" up a notch to "Threatened" by the American Livestock Breeds Conservancy. We are hopeful that we have played a small role by promoting this wonderful breed since 2002! Originally developed as a meat and fur rabbit, the American standard calls for bucks to weigh 9 lbs and does to weigh 10 lbs at senior weight. Long in body, topline starting behind the shoulder, the topline rises high over the hindquarter and down again, with a wide meaty loin. The color of the American Blue is supposed to be the bluest of all the blue rabbits. The Blue Imperial is already extinct. The Vienna Blue is gone from the U.S. and hard to find in Germany. We encourage breeders to take on the American Blue as a heritage animal, to preserve this breed that is unique to our national history and culture. Currently there are a small number of faithful breeders keeping this American original alive. 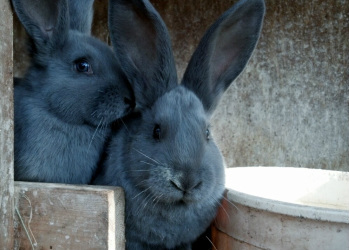 We sell rabbits for meat & pets and leave the show or exhibit breeding to the experts. Goat meat, or Chevon, is one of the most widely consumed meats in the world. However, its consumption in the US has generally been limited to specific ethnic groups. It has an excellent flavor somewhat similar to beef and venison. It has less fat than chicken or any of the red meats commonly consumed in the US. It has an excellent ratio of polyunsaturated to saturated fats making it a very healthy choice of meat. We expect to see consumption of goat meat increase as more and more people are introduced to its excellent qualities. Goat milk-What does goat's milk give you that cow's milk doesn't? In many parts of the world, goat's milk is preferred to cow's milk. Even in the United States, the goat is gaining popularity. Goats eat less and occupy less grazing space than cows, and in some families the backyard goat supplies milk for family needs. 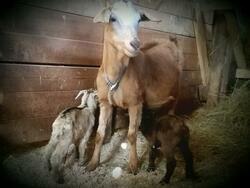 Goat's milk is more easily digestible and less allergenic than cow's milk. Our handmade goat milk soap contains no artificial preservatives or colors. Most people with problem skin, eczema (atopic dermatitis), acne and other sensitive skin care concerns find they can use our gently scented skin care products with good results. For our friends with especially sensitive skin, or hard to control atopic dermatitis we also offer a line of unscented products. We only use essential and fragrance oils that meet our high standards for quality.